While International Student Conferences (ISC) subsidizes a majority of KASC expenses, delegates are responsible for a participation fee. The real cost of each delegate is $6,000+ but ISC subsidizes the cost so that delegates pay only $3,500. The fee will cover Korean delegates’ international flight from Seoul to the first site in the US, as well as the international flight and all ground transportation during the conference. Korean delegates are responsible for arranging their own domestic transportation from Seoul to their homes at the end of the conference, and for arranging their own transportation to Seoul before the start of the conference. American delegates are responsible for arranging their own domestic transportation to the first site in the US. The fee will cover their international flights and all ground transportation during the conference, as well as the international flight from the last site in Korea to a single location in the US (Seattle) at the end of the conference. Delegates are then responsible for their own individual travel home from Seattle. Each year, 60-80% of delegates receive partial or full scholarships from their schools or financial assistance from other sources. Fundraising can seem complicated and intimidating, but past KASCers have been very creative and successful in raising funds. 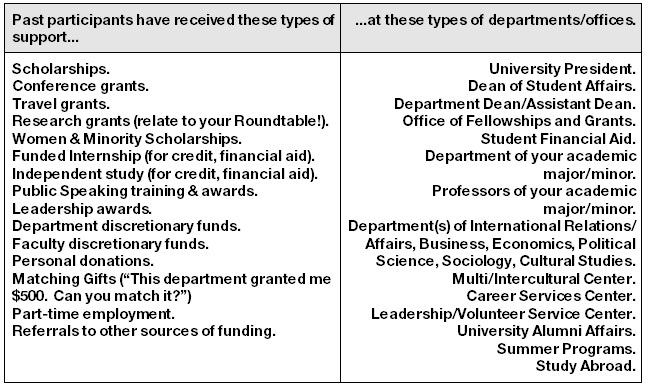 Below are some funding resources. Many delegates have been successful in obtaining funding from university departments and organizations. Korean and American corporations in hometown area or affiliated with your university are additional sources for funding. Identify businesses in your area that would be interested in investing in you and your experience with KASC. Contact the Community Relations/Public Affairs/Corporate Social Responsibility office of the company and set up a time to meet with a representative. The Chamber of Commerce or other Korea-related local societies in your area may have a list of corporate members whom you may use as contacts. Internationally-minded nonprofits may also offer their own scholarships. Be sure to check with the ISC office to coordinate so that corporations do not receive duplicate requests. Feel free to contact the ISC office for further advice and details on fundraising options at 202-289-9088.